Anyone else super curious about how others spend their days? 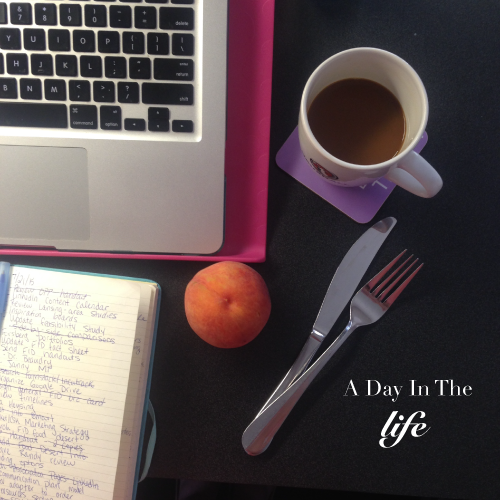 These types of posts are some of my favorites to read – they’re a peek into how someone prioritizes and just how productive they mange to be in a day. For me, the bulk of my productivity happens while I’m at work. When I get home, I’ll trudge through some homework, but mostly end up lost somewhere in the internet getting distracted. Most of my days are pretty different. Work is the consistent thing this summer, but beyond that anything is up for change. Some mornings I decide I need to sleep in, some I get up and do some sun salutations. If I’m feeling productive after work, I’ll get more homework done and stay up late. If I’m tired, it’s early to bed. 6:45 am – Alarm number 1 goes off. I decide I’m not ready to be awake. 7:00 am – Alarm number 2 goes off – I’m awake. Check phone notifications and social media. 7:20 am – I decide I probably need to get out of bed. So I get up and shower. 7:45 am – Finish getting ready for the day. 8:00 am – Make breakfast: English muffin with avocado. I pack fruit to take into the office. 8:15 am – Grab my stuff and run out the door. I’m feeling late, per usual. 8:30 am – Show up at work. First things first, get a cup of coffee. 8:30-1pm – Work. Today’s projects include researching marketing stratgies, writing a communication plan and drafting LinkedIn posts. 1:00 pm – Break for lunch. It’s a staff lunch today with barbeque. 1:45 pm – Back to work. 4:00 pm – Decide I’ve stopped actually accomplishing anything. It’s time to head out of the office. 4:35 pm – Arrive home. Turn the kettle on to make a pot of iced tea and decide what I’m having for dinner. It takes me a while, cause it’s just too darn hot to cook. 5:00 pm – Make dinner. Quinoa salad with beans, corn and avocado. Yum. 6:00 pm – Eat dinner. Watch an episode of Psych while I eat. 6:45 pm – Decide I need to be productive. Work on blog posts and homework. 9:45 pm – Off to bed. Good night moon!